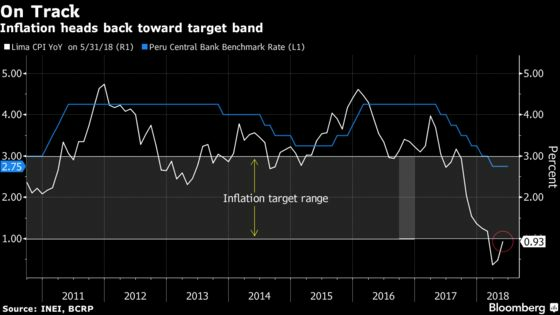 (Bloomberg) -- Peru kept borrowing costs on hold for a third consecutive month as faster growth and inflation reduces the prospect of further interest rate cuts. The central bank board, led by bank President Julio Velarde, maintained the benchmark lending rate at 2.75 percent Thursday, matching the forecast of all 13 economists surveyed by Bloomberg. The inflation rate is rallying after touching its lowest level since 2009 in March in line with stronger domestic demand after the central bank cut the key rate to its lowest level in seven years. In a statement accompanying their decision, policy makers highlighted “clear signs of dynamism” in the economy while forecasting inflation will return to the target band this month and converge to 2 percent by year-end. “The board considers it appropriate to keep the monetary policy position expansive until it’s clear that said convergence” will take place in a context of anchored inflation expectations and economic growth close to its potential, the statement said. The pick up in indicators such as retail, construction and mining investment, and smoother relations between the government and the opposition, all bode well for stronger growth in the coming months, said Marco Aleman, an analyst at Kallpa Securities SAB. Still, growth remains below potential and inflation is recovering more slowly than expected, justifying the central bank’s pause, he said. Inflation accelerated to 0.93 percent in May, just short of the central bank’s target range and below the median estimate of analysts surveyed by Bloomberg. “The stability in inflation expectations and a more optimistic view on the economic recovery reduce the possibilities of a new reduction in the benchmark interest rate, at least in the short term,” Scotiabank Peru analyst Mario Guerrero wrote in a June 4 note to clients.